Drew Estate is flexing its creative muscles with the new Kentucky Fire Cured, a three-size cigar line whose blend, which has yet to be finalized, will contain some American tobaccos normally used for dry and moist snuff that have been fired cured over hickory, maple and oak woods—an uncommon method for the premium sector. Kentucky Fire Cured will be introduced at this summer's IPCPR trade show as a line extension of the My Uzi Weighs a Ton (MUWAT) brand, the joint cigar venture between Subculture Studios (Drew Estate's artistic entity) and Joya de Nicaragua (the Nicaraguan factory for which Drew Estate is the distributor), which debuted in 2011. Like the other MUWAT sizes, Kentucky Fire Cured will be rolled in the Joya de Nicaragua factory. According to Drew Estate co-founder Jonathan Drew, the idea for the Kentucky Fire Cured project was first developed a little more than two years ago during a trip with Steve Saka, chief executive officer of Drew Estate, to tobacco merchant Universal Leaf's Dominican Republic facility. It was there that they replaced the wrapper of a Liga Privada T52 with a leaf of Kentucky fire-cured tobacco. That leaf, which came from a seed variety called KY-171, imparted a unique, smoky flavor, said Drew, but due to burn issues, needed some more work. Curing tobacco via flame is an interesting process. Unlike air-cured tobacco, fire-cured tobacco is hung in large barns over smouldering fires of varying woods for a time ranging between three days to ten weeks. This method not only browns the tobacco, but also infuses it with a smoky quality. Fast forward to today—Drew Estate has become better acquainted not only with Kentucky-grown, fired-cured tobacco but also fired-cured tobacco grown in Virginia. Additionally, Drew says the company worked with Universal Leaf to grow an Italian-seed tobacco, which is also fire cured, in a country of origin Drew will not disclose until the trade show. All three of these fire-cured tobaccos could end up in the final version of the Kentucky Fire Cured blend. While the filler of Kentucky Fire Cured will definitely include both Kentucky and Virginia fire-cured tobacco, along with Brazilian Mata Fina and Nicaraguan leaf, Drew says the company is still debating what leaf the binder and wrapper will be and how the "mystery" fire-cured tobacco will be included. Connecticut-seed, shade tobacco grown in Ecuador could also be used in the final blend, either as wrapper or binder. Although the binder and wrapper are still being debated, the three sizes of Kentucky Fire Cured have been established. 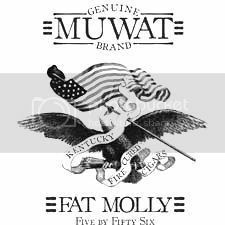 While the original MUWAT sizes were all 60 ring gauges with different lengths, the sizes for Kentucky Fire Cured will all be under 60 ring. "There will be a size for every type of cigar smoker," said Drew. The three sizes planned for Kentucky Fire Cured are Just a Friend, which is 6 inches by 52 ring gauge; Fat Molly, a 5 by 56 robusto; and Chunky at 4 by 46. All will come in packages of 10, wrapped in the familiar brown paper used for the MUWAT brand. While prices have not been finalized, Drew estimates the cigars will range in price from around $6 to under $10. Ook deze vind ik erg interessant. Pauli schreef: Ook deze vind ik erg interessant. Deze wil ik ook graag eens proberen. Gister is er op de amerikaanse site Cigaraficionado een artikel geplaatst waarin staat dat na 8 jaar, Steve Saka opstapt. Het aandeel van hem in Drew Estate is door hun overgenomen en zijn ze overeen gekomen dat Steve Saga de komende 2 jaar niet werkzaam zal/mag zijn in de sigarenindustrie. Hieronder de link naar het volledige artikel. Re: Drew Estate nieuws: Steve Saga "Retired"
Groot nieuws dit!!!! Saka (met een k Thomas ) is als ik het goed heb degene die bij Drew Estate ervoor gezorgd heeft dat ze ook niet-smaak sigaren zijn gaan maken. Liga Privada is in eerste instantie voor hem persoonlijk gerolt, omdat hij die smaakzooi niet zo kon waarderen. Daarom staat op al die bandjes por el jefe. De Flying Pig No 9 is ook voor hem speciaal gemaakt jammer dat deze man weg gaat. Re: Drew Estate nieuws: Steve Saka "Retired"
Lijkt me heerlijk, aandelen cashen, twee jaar vakantie en dan met frisse moed aan een nieuw avontuur beginnen. Jaloers!!! Dit is wat Steve er zelf over zegt. First off - it was ABSOLUTELY on good terms - DE has been my life for the last eight years and it just came down to I could no longer have my family in NH and live here, Miami and Nicaragua all while being the CEO of a company as dynamic as Drew Estate. I was basically spending 4 or 5 nights a month with my wife, and JD/MS/MC, the whole crew understood and was very compassionate and we worked out a transition plan that was 100% equitable for all. So my take on it is two fold: it is a good thing, but I will admit I am sad to be departing as I will miss being part of the DE family. Arie schreef: Lijkt me heerlijk, aandelen cashen, twee jaar vakantie en dan met frisse moed aan een nieuw avontuur beginnen. Jaloers!! !